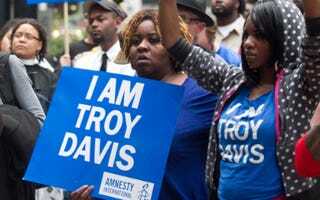 “Troy Anthony Davis is preparing to die for the fourth time today,” The Atlanta Journal Constitution reports, more than 20 years after being convicted for murdering an off-duty police officer in Savannah, Ga. The divisive case against Georgia death row inmate Troy Davis has, once again, made headlines across the country as the state prepares to execute Davis by lethal injection tonight. According to the Atlanta Journal Constitution, Davis will get a chance to say parting words to his family, sit down for his last meal and make a final statement to the public and reporters before his scheduled execution at 7 p.m. While the NAACP originally stated that Davis would refrain from eating his last meal, the Journal Constitution reports that Davis requested to be served the same dinner that the more than 2,000 other inmates will eat. After giving a recorded statement at 5 p.m., Davis will be quarantined and allowed to pass the last two hours of his life watching TV, listening to music or reading. Before being executed, state officials, family witnesses and selected media will be ushered into a viewing area one by one. At 7 p.m., Davis will be injected with a concoction of drugs that are expected to kill him within minutes. While Davis has exhausted his chances for appeal, an enormous outpouring by many in the public sphere and the media has helped to rally support for the death row inmate. Both Amnesty International and the NAACP have contested Davis’ conviction, pointing to the lack of blood or DNA evidence to tie Davis to the killing of Mark MacPhail in 1989. As Davis’ lawyers try to file a last-minute appeal, organizations, including Web site Loop 21, are making their own final appeals to stop Davis’ execution. Read more at Loop 21 and the Atlanta Journal Constitution.